Crews work on giant stick sculptures at the Morris Arboretum. You still have time to catch renowned artist Patrick Dougherty put the finishing touches on his enormous stickwork sculptures at the Morris Arboretum before they will be completed and open to the public Saturday, March 30. This is the third Dougherty has been an artist-in-residence at the arboretum. His first exhibit, "Summer Palace", debuted in 2009 and his second, "Waltz in the Woods," in 2015. Once erected, the sculptures remain in place for one to two years depending on the weather. 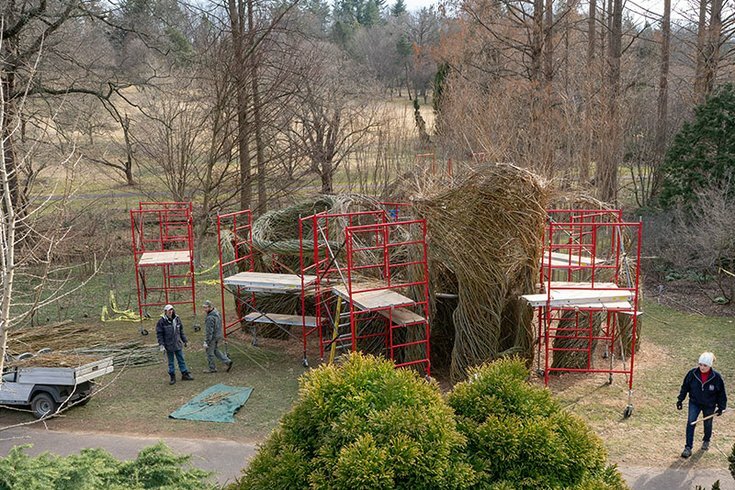 “The public loves the huge scale of Patrick’s work, which is typically 25-plus feet high, combined with the intimacy of being able to enter the woven structures to peek out through the windows and openings from inside,” said Susan Crane, Morris Arboretum’s Director of Marketing, on their website. The new sculpture will be built in the Madeleine K. Butcher Sculpture Garden. Volunteers and staff members are helping to create the sculptures from twigs, saplings, branches and sticks. 10 a.m. to 4 p.m. | $20 for non-member adults; $10 for children 3 to 17.